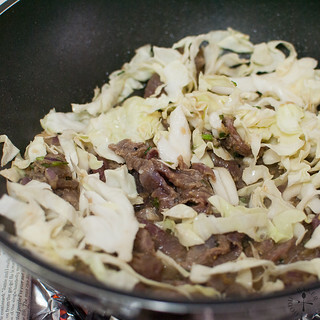 Bulgogi (불고기), which literally means “fire meat” in Korean, is a popular Korean dish involving the grilling of thin slices of marinated prime beef. 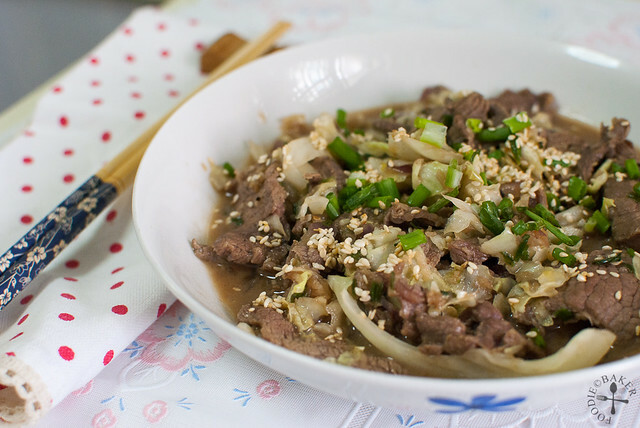 The beef slices are pre-marinated in a mixture of sugar, soy sauce, sesame oil, and sometimes garlic, onion, pear etc. 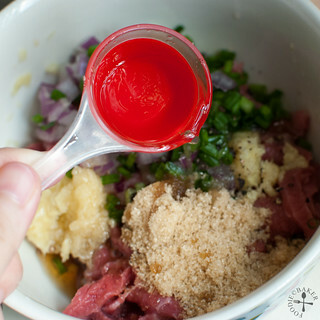 I got the recipe from Maangchi, a very popular website for Korean recipes – all of them looked really delicious and I have already bookmarked so many of them to try! I omitted the pear stated in the recipe as I was lazy to grate the pear, and as I can’t fire up a charcoal grill at home, I pan-fried them, adding some cabbage as well. 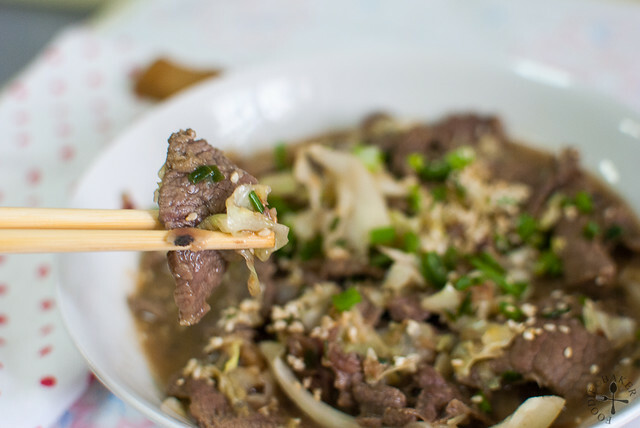 The cabbage lends a crunch to the tender and well-marinated beef, and the gravy is delicious over a bowl of steaming white rice! It’s a very easy dish that can be prepared ahead and cooked within minutes – a great weekday meal for the busy people out there. 1) Combine the ingredients together. 2) Add brown sugar. 3) Sesame oil. 4) Cooking wine. 5) And soy sauce. 6) Stir fry until cooked. 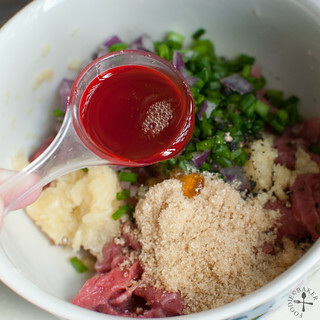 I’m submitting this to Aspiring Bakers #37: Korean – Feast of Hansik (November 2013) hosted by Grace of Life can be simple! 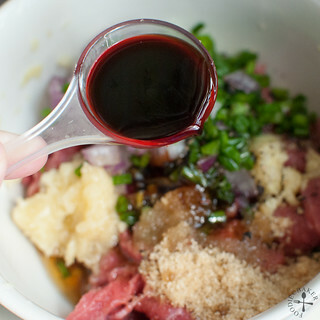 Combine the beef with all the marinade ingredients and marinate for at least 4 hours or overnight in the refrigerator. 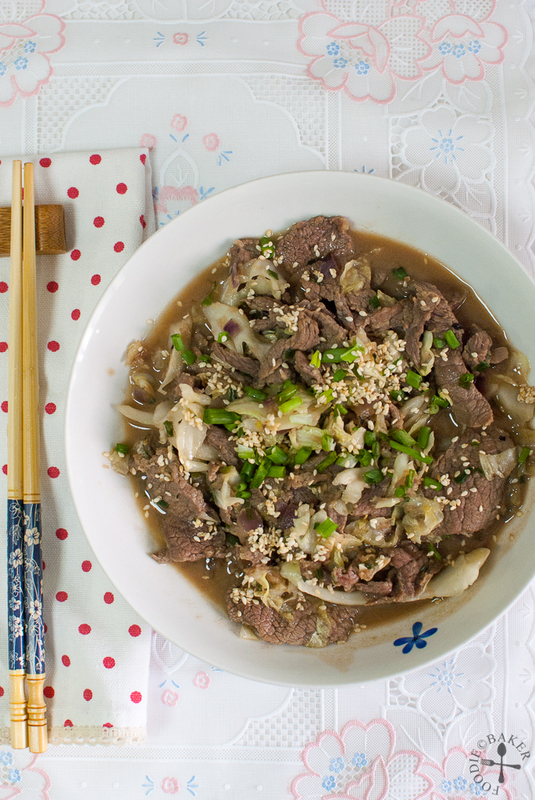 Plate the beef, garnish with sesame seeds and chopped spring onion and serve immediately. 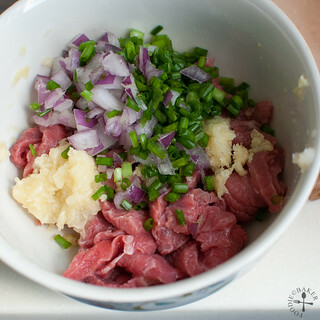 - Freezer Meal: After combining the meat and the marinade together, transfer them into one ziploc bag, or two if you are making individual portions. Label the ziploc bag and freeze it until needed. Thaw either in the refrigerator overnight or place the ziploc bag, still sealed, in a bowl of water for quick thawing. Proceed with the rest of the Steps. In Korea, bulgogi is often served with a huge bed of lettuce and ssamjang – a thick, spicy chilli paste. The beef is placed on a leaf of lettuce with a little ssamjang and often a clove or garlic or two, then wrapped up and eat altogether. 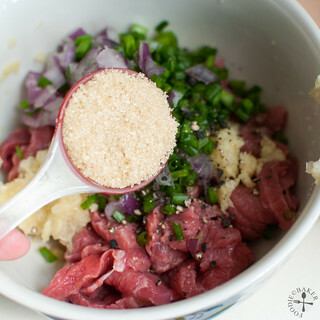 I served my bulgogi with rice – I love scooping the gravy and pour it over my rice – yum! Use a good cut of beef like sirloin, tenderloin etc, one with a good marbling to yield the best results. Beef at room temperature can be quite hard to slice, so freeze it for 15 to 30 minutes and it should be easier to slice the beef. Slice the beef against the grain – see here for some serious science behind it! Instead of pan-frying the beef, fire up a grill and grill them away to desired doneness. Mmmm I love Maangchi’s recipe! It’s what I use for my bulgogi too! I’ve heard from aunties that you can also use Sprite if you don’t want to use apple or pear, how funny is that? I’ve yet to try that though. Your bulgogi looks just beautiful and so delicious! I’m not a big meat eater but when the beef is sliced so delicately and flavored with this gorgeous spices it’s irresistible. Love the combination of flavors and will prepare this dish soon.